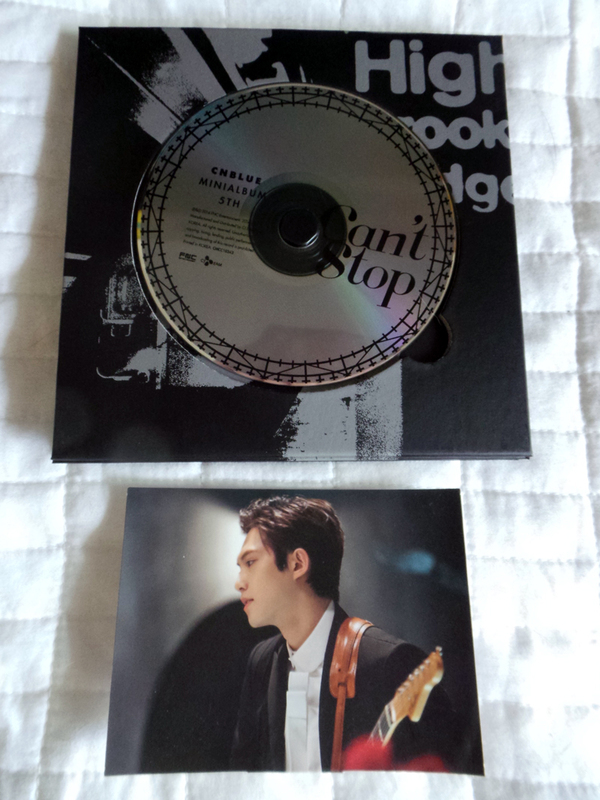 AKA all the CN Blue! I’ll just really have to add that other shelving unit – who cares that I won’t be able to shut my door! I can sacrifice for the Kpops! Due to the sad events in Korea with the Sewol ferry accident, a lot of comebacks have been postponed, so understandably there hasn’t been a lot of activity in the KPop world this past month. I’ve chosen to bundle most things that were released in April with other albums due out in May / pick them up in person when I’m at the BAP concert in Melbourne next week. Ahhh CN Blue – forever one of my first KPop loves! I loved the featured single ‘Can’t Stop’ as soon is it was released and especially loved having the boys all over the music shows as a part of their comeback promotions. Yonghwa does also get +10 hotness points for his live piano playing skills (not quite enough to make him my bias, but he’s a very close second). Being an actualfax band who play instruments, it helps that they’re all total flower boys as well. The mini album has a nice photobook with loads of photos with the members looking pensive and dreamy in what I can only presume is an American city as well as wearing cute white sweaters and lounging around on beds (cue all the slash ficcers going crazy). It also came with a standup card with a randomly chosen member. I got Jonghyun (yay! my bias!). 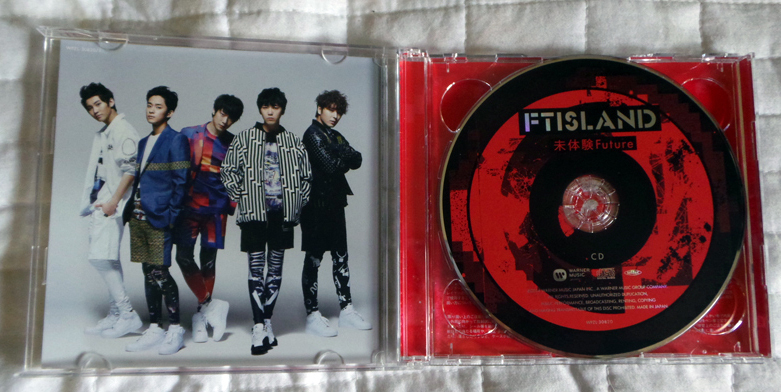 I like all the tracks on the CD too – so I’d definitely recommend buying if you’re a fan. I already made a post about this one! And I suddenly decided that I really really liked the cute one JongKook that reminded me a bit of Woohyun from Infinite. I believe that the words “He’s like a baby Woohyun” were uttered / typed followed by “I think I might make him my bias” and then “NOOOOOO BEC HE’S THE MAKNAE* NOOOOOO HE’S 15 OMG!” from Emily and then immense horror and a meltdown of epic proportions ensued (I COULD BE HIS MOTHER WAAAEEEEEE – technically a teenage mother but it could have happened), but it was too late *sobbing all over the place*. And that is how I came to have a ’97 liner in my bias list. 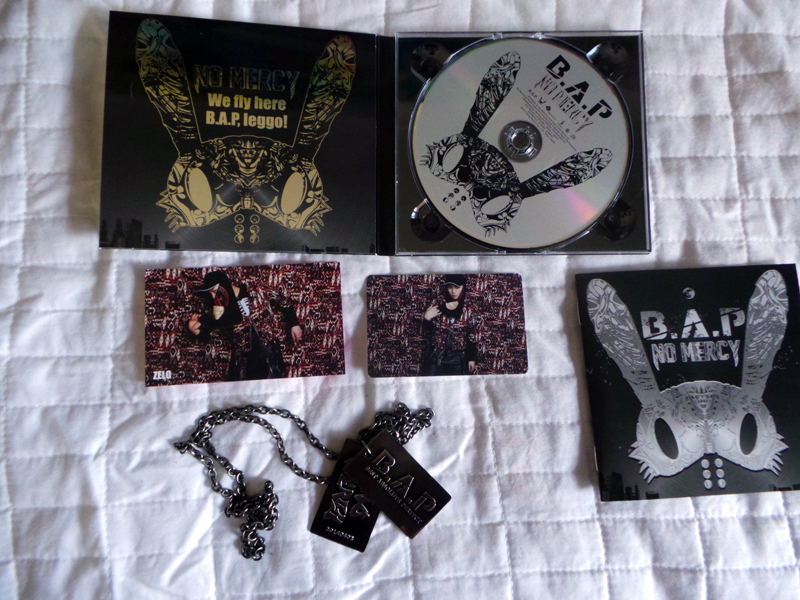 Anyway this is a fab album with a HUUUUGE photobook and extra goodies (a sticker set and a bookmark. Yay I got J-Hope, who is technically over the age of 20) and they are well deserving of all those ‘Rookie of the Year’ titles they won last year. O? R U L8 2? Also – they are in Pyjamas in the MV – I am helpless *cannot deal nosebleed* The teasers for this MV were hilarious as well – what’s not to like about cute boys being slapped in the face? A-PRINCE have a fab Youtube channel because they sub ALL their behind the scenes stuff in English and it’s all adorable as hell! This was a super cute single too.